I know I haven't posted in a long time. I was planning on making this private but it hasn't happened and may not. We haven't posted this on our blog though we have on facebook, but we are pregnant! We are almost 24 weeks pregnant with another little girl. We are soooooo excited!! I have been an exhausted prego recently. I feel like I barely make myself stay awake all day but otherwise it's been a GREAT pregnancy. We're so excited to be "Benny and the Girls". Cassi is getting bigger with every day and she is so fun. We think she'll love having a baby sister! We recently bought a house and she is loving having space - so are we!! We have wonderful neighbors and we loooooooove the house. It is ideal. We couldn't be happier about where we ended up. Ben is still working full time and going to school and he's doing a great job of handling everything. He's only 3 weeks away from the end of the semester and then he only has two more semesters until he's done with graduate school. Yay!!! I originally posted a video but it was having some issues so I took it off and I'll just post some pics and a better update in a couple days. Going Private and Our Fun Summer Adventures! 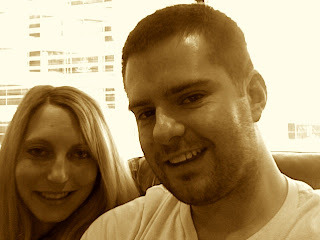 Benny was so sweet as to remind me today that I hardly ever update our blog. So, here I am! Before I give an update, I would like to let all our friends and family know we will be going private with our blog in a week or two. If you would like to keep viewing our blog we would love it - just please email us at benandleslieevans@gmail.com. I know, I may sound crazy, but I have had a couple friends who have some weird stories about pictures being taken off their blogs or strangers from bad sites who've looked at their blogs. Now that we have a baby, we feel really protective of her so we are going private! We have had such a fun summer, though it went by way too quickly. Ben finished his last undergraduate class and started his masters degree last week! He is really enjoying it so far and is soooo excited to have his B.S. in Information Systems and B.S. in Accounting done. I'm so proud of him!! Ben invested in some camping gear and we had some fun campouts! Cassi went swimming in her float, wore sunglasses, and slept in a tent for the first time! The first place we went was up by Heber, UT. Cassi LOVED it!! Cassi having fun in the pool at our campsite! We then went camping at Bear Lake with our friends Ryan and Heather and their darling son. We also went to Institute date night. Cassi was very sweet the whole time and at the end got some one-on-one time with our teacher Brother Anderson! Cassi needed a break at Institute date night so her daddy put her on his shoulders for the first time. She loved it! We also have been fortunate to spend time with family! Cassi and her Grandpa at dinner. Cassi has so much fun with him! Cassi and her Nana Evans - Cassi loves her Nana! Below are a couple more random pics of Cassi from this summer. I have a few more great pics I want to post but will do so in my next post! We had tons of fun going to our cousin Eliza's Bat Mitzvah earlier this summer and pics from that will be in the next post too. We hope you all enjoyed your summer too!! Happy New School Year to all of you!!! 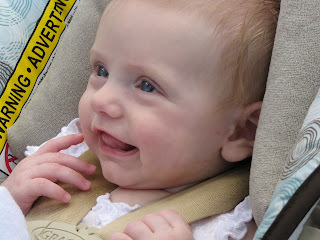 In the 4 months since Cassi's birth we've had a lot going on. Ben was offered an amazing new job with a valuation firm and he graduated from college! I'm so proud of him! Ben was also accepted into the U of U Masters of Accounting program and consequently will be starting it part-time in the fall. Yay! We are so fortunate that they started a part-time MAcc program at the U this year. It is the reason Ben will be able to stay at his job. We have been learning to be parents, and I truly mean learning. I was scared to even hold Cassi for the first few weeks, though since I had to hold her constantly I eventually got over that. Cassi struggles to gain weight but she's doing better and better due to supplementing, and she recently developed some cute fat rolls for the first time! We got to go visit my mom and sister a couple weeks ago so Cassi saw Arizona for the first time - my favorite state! It was such a fun trip and I think Cassi loved being so warm all the time. We've had so much more go on but since I have to type this one-handed while holding Cassi I'm worn out! I'll just sum it up by saying we love, love, love, love, LOVE being parents and we are so happy. I feel so lucky to get to stay home with our sweet little girl every day. She is amazing and I adore her!!! I'll post again soon!! Ben propped Cassi up to watch basketball with him. She loves it! Blessing day in a beautiful dress made by Aunt Julie! I try not to let Cassi watch much TV, but here she rolled over so she could see the TV! Introducing....Cassandra Joy! She's Finally Here!!!!!!!!! I realize I have been the WORST blogger so today I decided to get caught up! I started writing this post back on February 8th but somehow never posted it - so here it is! Cassandra Joy Evans is finally here!!! The last week has been more exciting, life changing, and simply simply amazing than any other week of our lives thus far. February 4th (our due date) we went in for a doctor's appointment. I was a little disappointed Cassi hadn't been born yet, and even more disappointed when our new doctor (our old one went out on maternity earlier than planned) told us our due date should actually be February 10th. I had dilated to a 4 though so that was exciting news. Ben asked her about doing a membrane sweep and she said we could do that and that it has a 50 to 60 percent chance of working. I had heard of so many people it hadn't worked for so I didn't know what to expect. Ben sent me home after the membrane sweep with strict instructions to walk, walk, walk that baby out! So, I walked to the Gateway mall to buy Ben some new clothes and then walked back and then I walked an hour on the treadmill. I didn't really feel too different than normal but then all of a sudden I started having strong contractions 3 minutes apart at around 8:40pm. I called my mom after about an hour of these contractions to ask her if they sounded like labor and she said yes and to get to the hospital fast! I wanted to wait a while longer to make sure, but Ben convinced me to go to the hospital. By the time I got to the hospital my contractions were so strong I was pulling Ben down to the ground by his hand since I could barely stand. They checked me as soon as I arrived and I had dilated to a 5 - I was in labor! The rest of the labor went by faster than I thought possible. I briefly thought about not getting an epidural, but after being warned of the pain I decided to go for it and I'm SOOOOOOOOOOOOOOOO glad I did. Did I mention I'm glad? Oh, I did? Well, let me tell you again I'm SOOOOOOOOOOO in love with epidurals. Oh my goodness, it was fabulous. As soon as the epidural kicked in I felt great and Ben and I slept/watched a movie until they came in to check my cervix again. My mom had thought I'd have a fast labor, and I think it would have been even faster if they'd come in and checked me earlier. By the time they came in I told them for the last hour or two I'd been feeling Cassi pushing down. They hurried and checked my cervix and realized it was time to push!! They raced to get everything ready and in the minute it took them to do this Cassi had already started to push her way out and they could see her hair (which is GORGEOUS by the way). We had ten minutes of happy pushing and out came beautiful, happy, strong, amazing Cassandra Joy Evans. They put her on my tummy and then on my skin and she just sat there staring at me. She cried a tiny bit when she came out, but once on my skin she was perfectly quiet and just kept staring me in the eyes. It was the sweetest few minutes. Ben then followed nurse Jaime around as she took Cassi's measurements and got her ready. I couldn't ask for a better husband or father. We are so happy and life is just more complete now that we have baby Cassandra Joy!! -We got married and went on our honeymoon to Cancun! I'm sure there are some other big things I'm forgetting but those are the ones that are coming to mind. We went out to our favorite Utah restaurant Epic Casual Dining and got all our favorites. They have the best ahi tuna dish there and I was very sad I couldn't eat it due to being pregnant so we will have to go back again soon! I am grateful for an extremely intelligent, kind, fun husband with a great sense of humor who fulfills me in so many ways and helps me be truly happy. He can make me laugh no matter how I am feeling, he balances me out, and he puts up with my crazy ways. I'm so excited to start a family with him! The above picture is kind of funny. It's one of our engagement pictures that Ben altered for Halloween ha ha. My computer started having issues last night so I don't have access to a lot of our pictures, so this will have to do for now! I will probably put up pictures from our wedding/honeymoon once my computer is fixed. Tuesday, December 30th I noticed something a little worrisome (I won't gross you out with what). I couldn't get in touch with the nurses at my doctor's office so Benny met me at the doctor's office so I could ask them face to face. The nurse there kind of blew us off with an explanation that didn't sound correct and she didn't offer to even check me, but I didn't want to worry so I just went home. Ben wanted me to go to Labor and Delivery before we left to get checked out (since my doctor's office is in the hospital) but I didn't want to. Ben did some research and talked to the nurse on call for the hospital and she said she would recommend going to Labor and Delivery just to get checked as Ben had wanted me to. I really didn't want to go but Ben insisted so I went begrudgingly, and it's a good thing! When I first got there they didn't think there was anything wrong, but then they realized I was having a crazy amount of contractions (apparently I don't feel contractions very easily) and my cervix was dialating. I was in pre-term labor! At one point they were pretty sure I was going to have the baby, but they tried some medicines on me to stop the labor and one of them finally worked. I had to stay in the hospital through New Year's Eve for observation, but we got out New Year's Day and Cassi is still cooking in my belly a week from the day we were admitted so we're really happy!! She was only 34 Weeks and 6 Days when we checked into the hospital (and she could have been 34 weeks if you go by her original due date) so we didn't want her to come that early. I've been on quasi-bedrest, but if it keeps Cassi in a while longer I don't mind at all. Ben's work was so sweet and bought us a whole bunch of baby things while we were in the hospital. It really helped us keep calm because they gave us a lot of things we didn't have yet that we really need for when the baby's here. They are wonderful! Ben's mom also came and stayed with me part of the night Tuesday night and all day Wednesday which I REALLY appreciated. She has a ton of things to do and I'm sure it was not a fun thing for her to be stuck in a hospital but it was so nice for me to have somebody with me all day and it helped me not be nearly as stressed about the situation. Thank you Mama Evans!!! Also thank you so, so, so, so much for those of you who called, visited, etc. It was a stressful time and we really appreciate all the support!! Onto less crazy things! We went to Arizona for Christmas and had such a great time! We celebrated my mom's birthday and had a GREAT time seeing all my family through the holiday. We miss them!!! We had a few family pics taken while we were all in town and I posted a couple of them below. Yes, as is obvious from the above picture I am HUGE right now. 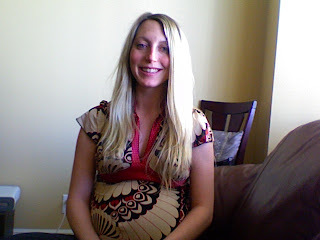 My prego shirts barely cover my belly these days and I'm still more than 4 weeks away from my due date! Thank goodness for a wonderful husband who renewed my gym membership for me this week along with getting me a few sessions with a personal trainer for after Cassi's born. I can hardly wait to reclaim my body and my wardrobe! We hope all of you are enjoying the new year and enjoying life. We are thinking of you and wish we got to see more of you more often. Today I decided I needed to start adding peoples' blog addresses to our page so we can be better at following them! I was going to email people first to make sure it's ok, but I got on a roll of adding them and didn't want to stop. So if you prefer to not have a link to your blog on here please just let me know and I'll take it off ASAP! Also if you don't see a link to your blog on here please let me know so I can add it! There were some blog addresses I couldn't find and I'd love to have them so we can keep up on what's going on in your lives better! Hi! I'm so sorry we haven't posted to our blog in FOREVER!! We are mostly finished with our condo remodel and we are once again living downtown! 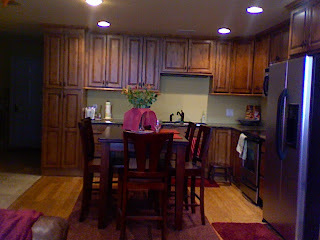 Here is a picture of our kitchen. We just had to use the camera on my laptop since we're having some camera issues, but it gives you an idea of how it looks. It looks a lot prettier in person or on a normal camera so we'll post some better pics later. The nursery is bigger than this picture makes it look like. We actually now have a white futon bunk bed on the wall across from the crib so we can have family come and visit. Obviously we haven't decorated it much yet but I'm working on that. 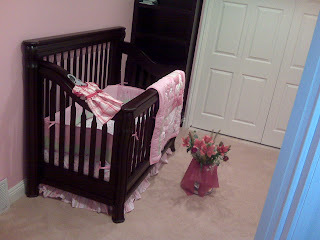 The best part of the nursery is that Benny surprised me by staying up until 4 am one night to get it all ready. He went out to the store in the middle of the night and bought the mattress, a new baby dress, and flowers for me so that it would be a big surprise for me the next morning. Isn't he amazing? I went and looked at the room at least 25 rooms that day alone. I know I've had many people ask to see pictures of me pregnant. Ben posted some on Facebook today from his phone which are fun photos but I look HORRIBLE. I don't know if it's that I'm in denial or if the camera on his phone just makes me look especially bland and huge, but here is one from my laptop camera that I think is a more accurate representation. I look especially red, but at least you can see that I do have facial features. I am 32.5 weeks pregnant, which means we only have 7.5 more weeks to go!! We're so excited!!! We keep hoping the time will go by fast now that the remodel is mostly done. I really don't mind being pregnant. I'm so excited about having our cute little baby the being pregnant part seems like a small thing to deal with now that I'm not extraordinarily sick anymore. However, there are still things I am looking forward to after the baby is born (in addition to meeting our cute little baby of course)! I am already dreaming of the day I fit into my old clothes again and can increase my heart rate with a little exercise without feeling like I'm going to faint. I am also already thinking of all the raw fish and sushi rolls I'm going to eat. Oh ahi tuna how I have missed you! Ben was sweet enough to take a break from studying so I could include him in a picture. If you think I look especially tired it is because our sweet little baby has made it nearly impossible for me to obtain enough oxygen. Poor baby, I know she's cramped in there but I still keep trying to move her downward so I can get enough oxygen to keep us both alive. I'm sure I look funny out in public because as I walk I massage my tummy to encourage her to move down. The need to breathe always wins out over my sense of propriety. My doctor said I'm a bit anemic and my blood pressure is especially low right now which explains any loss of energy/faintness I may be feeling. I say if I could just breathe I would have any energy I need! Ben noticed this morning my belly is a bit lower than it has been so we're hoping that's a sign that she's dropping into place. Yay! Ben has been extremely busy with school and work but he's doing a great job of staying on top of everything. Right now he's exploring his graduate school options. He may go straight into graduate school after he graduates at the end of the summer. He's heavily considering a program he can do while he keeps his current job. That means two more years of a lot of work for him, but he says it won't be a problem. I'm trying to figure out how I can do the school work for him so he has more Leslie and Cassandra time :). We love all of you and miss those of you we just don't get to see often enough. We hope you're having a wonderful holiday season and that you know we're thinking of you. We'll try to be better about posting updates! After I have the baby we'll probably be more into pictures so we'll be posting a ton! I'm still here, don't forget about me!